Help you decide if the book is worth reading in its entirety. Enable you to take immediate action on applying key ideas from the book in your daily life. Today’s edition (the first!) features Cal Newport’s So Good They Can’t Ignore You. Everyone desires work that is fulfilling, impactful, creative, and independent. Is the common wisdom surrounding the pursuit of such work misguided? If yes, what’s the optimal path towards it? 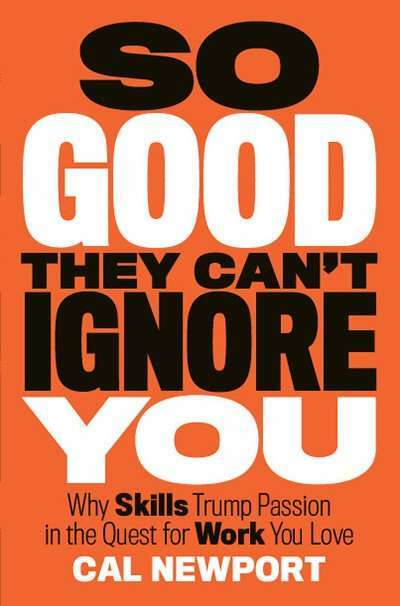 In his book So Good They Can’t Ignore You, Cal Newport argues against the ubiquitous message of finding your passion. He claims instead that fulfilling work requires rare and valuable skills — and that such skills are obtained with deliberate practice. As these skills are acquired and nurtured, they become capital that can be traded for more rewarding work. The book opens with the story of a man named Thomas, who believed he would find happiness within Zen Buddhism. He thus pursued life as a practitioner with an unrelenting clarity and passion. Years later, at a monastery where he was practicing lay monk, Thomas had a stark realization: he was fundamentally unchanged. This was a tough pill to swallow. Despite fulfilling his dream to become a Zen practitioner, Thomas still had the same unsettled feelings about his life. The key to his happiness did not lie in simply following a passion for Zen Buddhism. Thomas’ story is foundational to the question this book seeks to answer: If following your passion isn’t useful advice, what is? In essence, the craftsman mindset encourages bringing fundamental curiosity and ambition to your work. Rather than demanding fulfillment from your job at the onset, you must demonstrate value first. In order to deconstruct the passion hypothesis, Newport turns to Steve Jobs. Newport digs deeper into Jobs’ path to founding Apple. What he finds is that Jobs actually started out with a small-time ambition of making a few extra bucks. His vision only evolved and grew into something much bigger through stages. So, it isn’t as if Jobs settled on his passion from day 1 and went after it. By some accounts, Jobs actually exhibited disdain for a career in technology early on. It’s important to distinguish that Newport isn’t downplaying the significance of passion when it comes to work. He’s simply cautioning that it shouldn’t be viewed as a necessary precursor to finding fulfillment through work. Rather, he concludes, passion is a side effect of mastery. In other words, the craftsman mindset trumps the passion mindset if the goal is create work you love. In turn, a craftsman mindset enables the accumulation of career capital — which brings us to the next point. To demonstrate his career capital theory, Newport tells the stories of Alex Berger and Mike Jackson. Now a successful television writer, Alex Berger moved to Los Angeles lacking concrete career goals. Once there, he assessed what was valuable in the market, and worked aggressively to acquire the necessary skills. He obtained lesser positions, putting him around those he wished to emulate. Then, he worked relentlessly to perfect his screen writing on the side. After ungodly hours spent writing and receiving feedback , Alex arrived at his sought-after stature. He didn’t set out to become a television writer, but he didn’t get there by accident. Then there is Mike Jackson, who’s attained partner status at a cleantech venture capital firm. Mike’s job is so desirable, he can’t keep up with emails from business school students who aspire to his title. But it isn’t as if working in VC was ever Mike’s goal or ambition. Much like Alex above, Mike’s path wasn’t defined by passion. Through graduate school, leading a highly successful energy research project, and founding an energy startup, Mike arrived in VC. Yet, he hadn’t even considered VC until the short window of time leading up to his interview at the firm. An interview, by the way, that was arranged through happenstance by an unlikely connection. Moving along, Newport finds that the best way to build valuable career capital is through deliberate practice. For performance artists and athletes, deliberate practice is mandatory for success. Yet, due to its unenjoyable nature, such practice is often neglected by knowledge workers. Ability to tolerate the discomfort of performing a task that is mentally and/or physically straining. Ability to improve by embracing honest feedback on your work, which may be harsh. To highlight the significance of deliberate practice, Newport turns to the game of chess. More specifically, he looks at a research study that was published by a psychologist named Neil Charness. Charness and his team studied the practice and habits of chess players, hoping to find what separated the elite. The study gathered data spanning multiple decades. It focused not only on how long chess players practiced, but how they practiced. The data did not leave much room for doubt. It didn’t merely find that hours spent in serious study of the game was the most important predictor of skill. It found that it dominated the other factors, such as time spent in tournament play. Having applied the craftsman mindset to acquire career capital through deliberate practice, you’ll have reached a new summit. That is: the power to claim control over what you do, and how you do it. External resistance: When you have sufficient career capital to acquire more control, you’ve become valuable enough that your employer will fight your efforts to claim it. People in your life may also question your courageous decisions. Newport provides an example of internal miscalculation through the story of Jane, a talented student at a competitive university. However, Jane wasn’t inclined to follow the traditional post-college path into employment. Jane’s plan to generate passive income from websites didn’t pan out. Having dropped out of college and needing money to eat, her sights shifted instead to making ends meet. Jane had made the fatal mistake of cashing in on control, while having little career capital to offer in exchange. For an example of external resistance, Newport tells the story of a software developer named Lulu Young. After college, her first job was the less-than-glamorous role as a QA tester. Rather than become frustrated with her low position on the totem pole, Lulu took matters into her own hands. She went down a rabbit hole and developed scripts to automate testing. This offered immediate value to her team, and she was quickly promoted. At this point, Lulu made her first attempt at cashing in for more control. She asked for a 30-hour work week so she could pursue a graduate degree part-time. Her employer didn’t like this idea, but she had become too valuable for them to say no. Similar stories repeat throughout Lulu’s career. She subsequently changed jobs multiple times, each time cashing in for more control. Today, she is a freelance developer and makes her own schedule. But it wasn’t easy pushing through multiple points of resistance to get there. Each time Lulu cashed in, she faced pushback from her employer as well as friends and family. Newport argues that this resistance takes thick skin to push through, and that it would be enough to keep most people right where they are. I’ve personally found the lessons of this book to be profound and immediate. In the admittedly small amount of time since I’ve finished reading, I’ve made key changes in my daily approach. It remains to be seen if these changes will sustain, but I believe they will. I can point to a few other examples in my life where big ideas immediately clicked with me, and immediate action was taken. Those actions have indeed sustained to this day. There are so many nuggets in So Good They Can’t Ignore You, and it would be impossible to cover them all here. The highlights above, and the stories behind them, provide powerful examples that can be used to achieve remarkable work. They are just the tip of the iceberg. Newport interviewed many subjects on his journey to answering the questions posed in this book, and each offers a compelling story. The value of this book lies in those stories, and they are told in a relatable, immersive way. For that reason, I would highly recommend picking it up.